Yes. This was a good one. But I usually say that about all of them. There’s some really pristine countryside but in other areas, it seems that once someone throws some garbage, it’s open season to dump yours there. Roadside bins are overflowing. It’s a matter of money. Still, most of our riding was in areas where the scenery was beautiful with endless sunflowers in the flat areas and roadside wild fruit trees. There are dogs aplenty. Mostly they they ignored me but a few ran out. In general they are small and not a problem. In a few cases they did get the adrenaline pumping! There is no, repeat no, real bicycle infrastructure. There are no shoulders. However, the drivers are courteous, more so than I have encountered on average in North America. On the last day, a long flat stretch with zillions of trucks due to the highway being closed, you watched your line but there was never a problem. Pull-offs are every few hundred metres so you can always (and I did) take a break. If an adult cyclist is approaching you and you have to take a bet as to whether or not it’s a Randonneur … if you have to put down money … say yes. I only saw 4 other riders! There were kids and errand bicycles in the towns, but no cyclists. On the first day we had hot. It hit 99F on my Wahoo. It almost hit that on the last day as well. On the second we had chilly and windy (in our face, of course) to start. On the third night the temp dropped to 40F and rain; I was on the edge; I made it. The route was a figure 8 this year. Out to Varna then north for the first overnight. Back to Sliven for the second overnight. Into the mountains for the third overnight and then back to Sliven. The first two days were somewhat tough, mostly due to that headwind in the morning of the second day. A figure 8 makes it too easy to throw in the towel, which is what happened to 5 riders out of 11. The third day has a lot of climbing into the mountains, up a gorge late at night, water roaring. Back down that gorge in the morning, the views were glorious and then we climbed … a 30 km climb, up another gorge. There was payback from that, of course, with a long, long, descent to the valley followed by the seemingly endless ride north on the flat with all those trucks, back to Sliven. That last bit was the toughest for me, wanting the ride to be over, grinding along a straight, mostly flat, line. Lazar has run this 15 times now (or 14?). He changes up the route constantly and this was a hillier instance. I really enjoyed the ride. Even that last bit would have been OK had I remembered to bring some music to occupy my mind. I blew it. There were 11 riders including Lazar. Two Russians, one half & half Canadian & American (me), one half & half Bulgarian and American (Georgi), one Japanese and the rest Bulgarian. For the first part of the ride I was in the front half of the group but then, of course, the DNFs knocked off the back half :). The Japanese fellow and I traded places throughout the ride; Lazar was the lanterne rouge. Weather is always a variable, of course. The Japanese fellow said that it was hotter the last time that he did the ride. I think that Lazar made this time hillier than most but with those hills (gorges) comes the beauty. Rolling open countryside isn’t anywhere near as interesting. It’s a low budget ride. The accommodations at the start/finish & 2nd overnight at the Omega Bistro are friendly, clean and basic, with great food. The 1st overnight is what I would call dormitory – three single beds in one room – not shared – private bath as I recall. The 3rd overnight is rustic; a hostel in the mountains with foam mats on the floor and a shared shower. The atmosphere more than made up for the rusticity :). It’s well planned with food stops; coupons for those locations to encourage you to eat there; hosts well prepped to serve good, hearty food. The route this year went through enough towns that I was never short of food or liquids. I highly recommend the ride. Don’t let the almost 50% DNF rate scare you off if you’re considering adding this to your bucket list. Lazar is even willing to get input from potential riders on the routing. He’s done it enough that he can cut and paste to please. An interesting ride for sure. I’m not sure if I’d do this one again, but I say that about many of the 1200s, for a variety of reasons. Nick et al. set out to showcase the region. Combining downtown Washington, Annapolis and the Bay Bridge with climbs on Skyline Drive and through one of the Appalachian gaps, hitting the battlefields of Gettysburg — these all provided diversity and challenge. From a time perspective, the long run into Washington and the city riding with a multitude of turns affected average speed more than the long climbs and descents. There’s payback from climbing; none from jogging through suburbia. The route designers did achieve their objectives but it probably made the route more difficult than they expected. Degree of difficulty isn’t all about climbing. It’s a very difficult route for anyone to break 80 hours. I have a somewhat jaundiced view of heading into Washington; I lived in the Philly area long enough and saw the sights often enough, that it wasn’t new. Skyline Drive is spectacular and the Appalachian Gaps are challenging. In between we climbed and rolled. The run into Washington on commuter paths, 40+ miles of them, was new to me. I was pleasantly surprised that I could make reasonable time but for those who start these rides at a fast pace, the paths are speed limiting. I found it interesting. The weather was also provided diversity — mostly cloudy the first day; sunny and hot the second day, again with rain late; climbing easing up on the third day and more late-day rain, but it was a long 203 miles; rain all day on the fourth and final 200k, cool and chilling. The rain on the first three days had been warm. You had to be prepared for anything. At one point with heavy thunderstorms we took refuge at a waste treatment plant and then an open barn. Such is randonneuring! The DNF rate was somewhat high, around 35% for the 1200k riders. Nick thinks that was mostly due to the weather. I think that it was mostly due to the long riding days. The female DNF rate was zero. The Seattle rider DNF rate was 100%. It’s really too small a sample to say for sure and even if the ride is held every year for the next dozen years, different riders and different weather will produce different results. I rode with Hamid most of the time except, as usual, that first day. He always gets out ahead on the first day; this time he finished an hour before me. Jerzy from Toronto and Greg, a local rider, were companions for most of the ride. Jerzy slept in after the third day. He was riding strong; it wasn’t due to route or conditioning. I never felt that I was in trouble time-wise. Nick had made it clear that intermediate times were guidelines; the final time was all that counted. As such, I could plan a reasonable day for that day’s riding. The final day, for instance, turned out to be a 15 hour 200. We warmed up and dried off for extended periods a couple of times. Volunteer support was good. We started in Leesburg, spent two nights at the same place in Shepherdtown and the third night close to the BWI airport. There were loads of volunteers at the overnights; during the day we saw Bill taking photos and Nick providing water. Shab managed the overnights, doing her usual excellent job. I enjoy all these rides and this was no exception. It didn’t have the views of the Rocky Mountain 1200 nor the Cappuccino from Italy, but it worked for me. Sunday was the Vennachar 300, which was an amazing day on the bike! The scenery was breathtaking and the climbs were challenging. The weather was quite favourable for the first 200k with some sun in the morning to take the edge off the cool air. Soon clouds moved in which kept the sun off us. We had lots of rain for the last 80k but it also brought a nice tailwind and thanks to Peter Grant for loaning me a rain coat so I didn’t freeze. I forgot to pack a few important things for the week, namely my helmet and a rain jacket. Thanks to Peter and Guy for loaning me theirs for different rides! Ben and John were great company all day and we rode a good pace. I think this is a personal best on a 300 for me, 14:54. To round out the week, Barry’s Bay 600 was the final course on the menu. An epic route through a big swath of the Canadian shield. Our weather was great aside from a bit of headwind during the first 100km. I fell off the back of the group at the first control and did most of the ride alone, which was a nice change after riding with folks for most of the other rides. I tried to keep my control stops a bit shorter than normal to build up some sleeping time. The sun was mostly shining on Thursday but didn’t get too warm. The humidity did get worse until sundown, then disappeared once the night was upon me. I made Barry’s Bay around 2 and managed to get 3 hours of sleep. Woke up and was heading out to Timmies around six. I ate too much breakfast and had a helluva time getting started but managed to keep the pedals turning for a few hours until second breakfast in Eganville. The controls were evenly spaced so that made for a predictable day. I stopped for too long in Calabogie since they had vegan pizza and fried cauliflower wings at the restaurant that was the control! Again I ate too much (story of my life) and had a bit of a slow go for a couple hours. The hills were challenging on both days but worth all the effort, not just for the descents but also the views. The route slowly flattened after leaving the last control in Clayton as we approached the Ottawa Valley and there was a small gang of randonneurs at the finish to welcome the riders back! 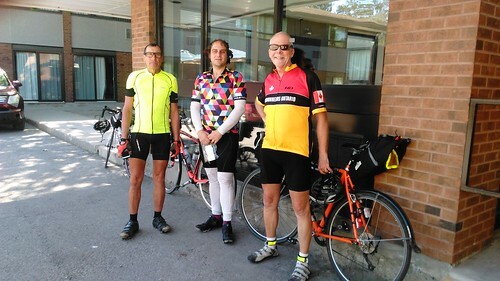 All in all I had a wonderful week and would like to thank Guy Quesnel for organizing, providing breakfasts, and supporting on the 400k, Peter Grant for route planning and supporting on the 300k. As well as a special shout-out to Vytas and Colleen for doing dropbags and support overnight on the 600K. We went through some sparsely populated areas and it would have been difficult to resupply without all of them! Also thanks to everyone I rode with, it was a great week of randonneuring.